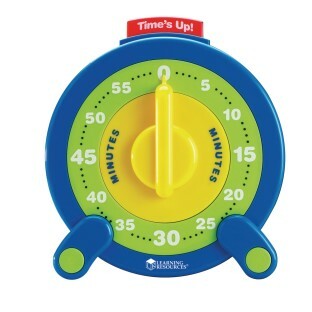 Use analog timers for tests, activities, centers, class cleanup and 1-minute math and reading fluency assessments. Button pops up and buzzer sounds when time is up. Tabletop or wall display. Easy-to-read 8"-diameter clock face. Hope this holds up to years of use! We rotate between small group activities 12x per day plus 2 more signals for the end of Oral Language Centers. I use it for a time out timer and potty chair timer. The only con is the Times up only works if you turn past 5 minutes.